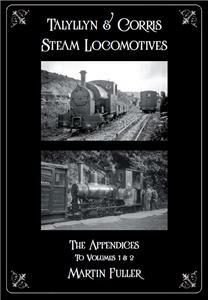 This volume provides an addendum, indices and a great deal of material origially prepared for Volumes 1 and 2 of Talyllyn & Corris Steam Locomotives. Included are an essay on teh construction of the Talyllyn Railway, an account from the Corris engineer on Falcon locomotives in the 1920s and further newspaper reports. Also included is further coverage of Fletcher Jennings and the Lowca works. The steam locomotive has always been the centre of interest for railway historians, but locomotive histories have, hitherto, struggled with the fact that a steam engine is essentially a tool designed to do a specific job, in a particular context, as economically as possible. Either the focus is on the machine itself, and the context which gave it birth is neglected, or the study is too short to do justice to the myriad factors which determine an engine's history. The six steam locomotives of the Talyllyn Railway are, at one level, unremarkable industrial tank engines – but their role on the world's first preserved railway, the rare gauge which ties them to the Fathew and Dulas valleys, and the changes to their role over the decades, has earned them a unique place in railway history. And all of them are now rather different machines from the ones that left their makers' works between 1864 and 1949. Understanding each of them, and why they have become the locomotives they are, is a story involving much more than the history of a small narrow gauge slate railway and its subsequent metamorphosis into a leading Welsh tourist attraction. So the TR locomotives are fortunate in their historian. Martin Fuller's first two volumes on the TR and Corris locomotives were a model of what an engineering history should be, but they left many intriguing questions unanswered. Now, the fruits of Martin's further researches are published in a third volume and, with the trilogy completed, he lays down his pen, leaving just a few tantalising puzzles for future historians to unravel – which is the essence of good historical writing. The new book is rightly called an Appendix as it supplements the narrative of the first two volumes rather than continuing the story in time. Here, we have more about the manufacturers; the Lowca and Falcon Works and, most importantly, Gibbons Bros. who rebuilt Nos. 1 & 2 in the preservation era. There is more about the personalities whose labour, often in difficult conditions, repaired and rebuilt the locos and kept them running – Martin has even identified the fitter who rebuilt the three Corris Falcons into one machine. And there is more about the people and politics of the TRPS, as that infant organisation strove to make a going concern out of a moribund railway, with little money and all the quirks of their newly acquired locomotive fleet. The volume concludes with comprehensive indices to all three volumes. A bald description of the contents cannot do justice to this new volume. As with the first two, it is lavishly illustrated with numerous photos, mostly never seen in print before, dating from the decades before preservation as well as the TRPS era. The voices of those most concerned with the early years are captured perfectly – and, for me, a colour shot of a youthful Roy Smith at the controls of No.3 in its 1950s guise is a pictorial gem, as it will be for all who fired to Roy over the years. Looking at many of the early pictures, the past does, indeed, feel like a foreign country. It is often hard to grasp the stages by which the run-down railway of 1951 became the polished operation of today, and how the six little locomotives “grew up” from basic shunters built by their makers into the reliable, air braked and relatively sophisticated machines they are now. Martin's three volumes together tell the story of how our mechanical inheritance of today evolved over a century and a half: 150 years in which engineering skills, the economics of the railway (and slate) industries, Welsh history – and, most of all, the personalities of the people who have cared for, operated and often struggled with six small steam locomotives – come together so that we can fully understand, and love even more, the motive power of our railway. Once again, this book comes in a limited print run. But your TR library will not be complete without it.